Dogecoin gambling enthusiasts and the rest of the community now breathes fresh air as the merge mining of the meme-inspired altcoin and Litecoin has finally begun after a lengthy period of much debate over its effect on Dogecoin’s market survival. The transition of Dogecoin to auxiliary proof-of-work (AuxPoW) mining officially started at block 371337, and this has caused the Dogecoin community to celebrate as the hard fork symbolizes the cumulative effort of the Shibes to improve the current state of their much-loved cryptocoin. All eyes are now set on the initial effects the merge mine will contribute to the barely a year-old cryptocurrency. Despite this, the community is filled with optimism that this development will only do Dogecoin well, giving its users renewed opportunities to really lay out the possible roads the digital currency may be heading for. In fact, recent reports have highlighted the efforts to extend a hand to the victims of the Kashmir flood, with donations already amounting to more than 1.5 million DOGE. This is a new endeavor for the Dogecoin community, which previously ventured into sponsoring sports and athletes like NASCAR racer Josh Wise. With more hash power up its sleeves, Dogecoin may now find its economy to grow steadily, and therefore, aim to encourage other individuals, whether inside or outside the cryptocurrency world, to mine the Shiba Inu-laden coin. 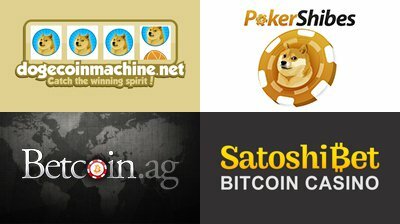 Platforms like DogecoinMachine, PokerShibes, and DogeDice.me are only some of the Dogecoin gambling brands that provide notable entertainment. SatoshiBet, which is an ever-growing cryptocurrency casino, even included Dogecoin to its list of supported digital coins like Bitcoin and Litecoin. Meanwhile, online Dogecoin gambling players who wish to use Litecoin to bet on casino games, sports, and poker can visit any of the Betcoin.ag gambling websites and satisfy their thirst to play and win payouts. As Dogecoin writes another chapter, its avid followers now await what surprises, downfalls, and most of all improvements will unfold during the entirety of its existence.